Casamicciola passenger and car ferry ticket prices, timetables, ticket reservations and information for ferries sailing from Casamicciola to Ponza and Ventotene. Compare all available Casamicciola ferry ticket prices in real time and book the cheapest available Casamicciola car and passenger ferry tickets sailing to and from Casamicciola, Ponza and Ventotene with SNAV Ferry Line ferries online with instant confirmation. 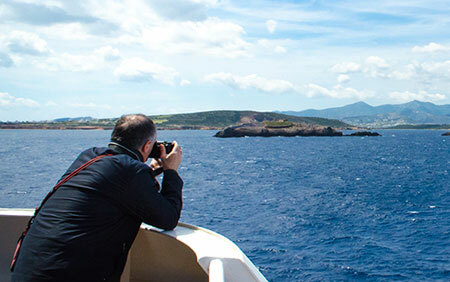 Book Casamicciola Ferry Tickets with SNAV Ferry Line for ferries sailing from Casamicciola to Ponza and Ventotene online in advance to enjoy the cheapest available ferry ticket price. The price you see is the price you pay. There are no hidden extras or surprises such as added fuel surcharges or booking fees and we do not charge you anything extra for paying with a Visa Electron card. The price we quote you for your selected Casamicciola passenger or car ferry ticket, onboard accommodation and vehicle type is all you will pay, and that's a promise. To obtain a Casamicciola ferry ticket price and book your ferry ticket securely online please use the real time ferry booking form on the left. You are also able to add a hotel at your destination, or anywhere else, to your ferry ticket when completing your ferry ticket reservation. Casamicciola, or Casamicciola Terme, is located on Ischia's northern coast and is renowned for its thermal springs. After visits by the Greeks and pirates (the locals are said to have hidden in a nearby cave), the town's renown as a spa spread in 1607, when a free thermal spa centre was set up for the poor. The thermal springs, along with a modern marina, are the town's greatest attractions. Casamicciola is divided into two parts; with one centre by the sea and the other up the slopes. More than any other town on Ischia, Casamicciola was devastated by the earthquake of 1883, and was subsequently rebuilt. From Piazza Majo, in the upper town, energetic visitors can head upwards towards Monte Epomeo, the island's highest mountain, and admire panoramic views. The area's sights include Casa Ibsen, where the playwright stayed, and the Castiglione, once a Greek fortress and now a thermal spa centre. In Casamicciola Terme you’ll be stunned from the marvel of the extinct volcano, visitable right to the end, as covered by a green and thick vegetation. Casamicciola Terme is enjoyable anytime of the year: let yourself be enchanted by the folkloric tradition of the living nativity scene… a very suggestive scenography admirable during Chistmas. Just below the hill of Castiglione, the gorgeous turquoise sea is even more embellished by the Grotto of Sibilla. The so-called Sibilla Cumana was a prophetess, a close up soothsayer that foresaw the future. She used to live in Cuma, an old village in front of Ischia. When the king Aristodemo ascended the throne of Cuma, Sibilla got constantly nettled and bothered from the king himself. Someday Sibilla, in order to show her immense power and how much she held the king in contempt, called her Vestals to lie on the sea over a huge mantle. She suddenly got on the mantle and, under the astonished eyes of the king and his courtiers, departed towards Ischia and took up her residence into the Grotto of Castiglione, later called "Grotto of Sibilla". Until the 60’s Casamicciola housed the most popular bathing-thermal establishments of the whole Campania. The thermal bath renowned all across Italy and over used to be Pio Monte della Misericordia. This historic establishment's founded in 1610 from the homonym congregation of Neapolitan nobles, in order to allow anybody to enjoy the amazing benefits of those natural thermal springs. Taking advantages of the free board, lodging and cures, every poor person of the island had the possibility to enjoy Casamicciola for 2 entire weeks per year. The resort was originally based in the area of Piazza dei Bagni and benefited the natural spring of Gurgitiello but, after the disastrous earthquake of 1883, it was rebuilt on the seashore. Unfortunately in the 60’s Pio Monte was totally abandoned and today its remains are still visible from the port. Fabbrica delle ceramiche Menella: ancient factory where to find precious baked clay pottery manufactures, made in the old Greek way. Piazza Bagni: the village’s most ancient piazza, with numerous thermal resorts nearby the natural spring of Gurgitello, like "Terme Belliazzi", built for want of the marquis Andrea D’Avalos. La Sentinella: small charming hamlet of Casamicciola Terme set on top of the green hill where to admire the geophysical observatory, that preserves old tools used to measure telluric movements as well as a very particular seismic pool, created by the scientist Giulio Grablovitz. Mount Rotaio: on the mountain you’ll find the crater of Cretaio, with very nice trekking alleys to reach Ischia Porto and Barano d’Ischia walking through the natural vulcanic fumaroles and luxuriant vegetation. Castiglione: one of the prettiest thermal parks of the island, located just between Casamicciola Terme and Ischia Porto. Here you’ll fully benefit the thermal waters in harness with nature. 21 June: Casamicciola celebrates the Patron Saint St Maria Maddalena. Casamicciola boasts the glorious tradition of Sambuca, that was indeed invented by the local Luigi Manzi during the Risorgimento. Best Price Guarantee - We always offer you our lowest available SNAV Ferry Line passenger and car ferries ticket price to and from Casamicciola. There are no hidden extras or surprises such as added fuel surcharges or booking fees and we also we do not charge you anything extra for paying with a Visa Electron card. The price we quote for your selected Casamicciola ferry ticket, onboard accommodation and vehicle type is all you will pay, and that's a promise! In the unlikely event you find the same all inclusive Casamicciola ferry ticket cheaper in the brochure of any other tour operator we promise that we will do our best to beat that price or offer you the choice of requesting a refund. To book Casamicciola car and passenger ferry tickets please click here. At ferryto.co.uk you are able to obtain live Casamicciola ferry ticket prices, check availability and book car and passenger ferry tickets to and from Casamicciola at our lowest available ticket price. Ferryto.co.uk is part of the world's largest online ferry ticket distribution network providing the ability to book over 80 major European ferry operators including to Casamicciola and to over 1,200 other ferry routes throughout the UK, France, Spain, Ireland, Holland, Eastern Europe, the Mediterranean, the Baltic and North Africa.